Brothers Zluty and Bily live happily in their little house in the desert. Every year Zluty journeys to the great forest while Bily stays to tend their desert home. And every year Zluty returns with exciting tales of his adventures. But then a devastating red wind sweeps across the land destroying everything in its path. And each brother must fight for his survival. 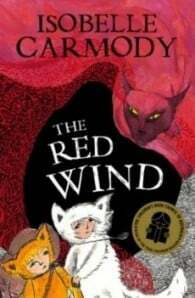 Isobelle Carmody is Australia's most highly acclaimed author of fantasy titles for older readers. She began her first book, Obernewtyn, when she was fourteen and since then she has written some of our greatest works of fantasy. Whilst she is perhaps best known for the Obernewtyn Chronicles (now comprising six volumes), her novel The Gathering was joint winner of the 1993 Children's Literature Peace Prize and the 1994 CBC Book of the Year Award. Also, Greylands, was joint winner of the 1997 Aurealis Award for Excellence in Speculative Fiction - Young Adult Division, and was named a White Raven at the 1998 Bologna Children's Book Fair. She has written many short stories for both children and adults and her picture book The Wrong Thing, illustrated by Declan Lee. Isobelle's first book in a new series for younger readers, Kingdom of the Lost: The Red Wind was winner of the CBC 2011 – Younger Readers Award. Isobelle divides her time between Prague in the Czech Republic and her home on the Great Ocean Road in Australia.